Surrey Heritage has been awarded a grant from the Heritage Lottery Fund to establish an ambitious project to commemorate the Great War Over the course of the next four years, ‘Surrey in the Great War: A County Remembers’ will be at the heart of the county’s commemoration of the First World War and the quest to understand how the war changed the face of Surrey and the lives of its residents. The grant of £458,800 will enable them to collect and publish on-line community-based research exploring all aspects of the impact of the war on the county and the experiences of those who served on the home front and overseas. 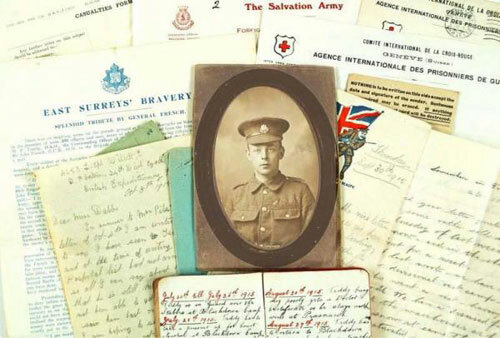 At the project’s heart will be a new website recording the stories of Surrey’s towns, villages, organisations and individual men and women who endured the war, both those who survived and those who fell. This constantly expanding and developing resource will enable people to explore and understand the impact of the war on the county. The project hopes to encourage local people to get involved as volunteers, to share their knowledge and skills with others in order to develop self sustaining communities with broader and more robust engagement with heritage. As a result memories and memorabilia of the war, in danger of disappearing with the passage of time, will be captured for posterity. A range of workshops and events will introduce the project to all parts of Surrey and Surrey Heritage with work with the county’s Arts Partnership to create an imaginative interpretation of some of the project’s discoveries. With the support, enthusiasm and energy of current residents of Surrey and those with former links to the county, the project will create a fitting tribute to the sacrifices and suffering of their forebears of 100 years ago who endured the first global, industrial war in human history. The full project will run throughout the remaining 4 years of the commemoration of the war, culminating in November 2018. It will then become part of the daily work at Surrey History Centre and be available for further research after the end of the Centenary. “We’re delighted HLF has provided this financial support to commemorate Surrey’s contribution to protecting our country 100 years ago. “Thousands of men from Surrey alone died in the First World War and many people’s lives back home were changed by it forever and this project will enable communities to explore the local wartime stories behind artefacts and memories to build a lasting digital and physical legacy for generations to come. Stuart McLeod, Head of HLF, South East, said: “The impact of the First World War touched every corner of the UK and the centenary commemorations are giving people new insights into the impact of the conflict, both in the battle zones and on the Home Front. Heritage Grants applications are assessed in two rounds. A first-round pass is given when HLF has endorsed outline proposals and earmarked funding. A first-round pass may also include an immediate award to fund the development of the project. This was the case with Surrey at War when a £22,000 development grant was awarded. The £460,000 grant now confirmed is a second-round award to enable delivery of the project.